I recently found an only Disston D8 saw at my parents house. The handle is beyond repair and needs to be replaced. I’m willing to have a go making it but I was wondering if anyone is aware of a template I can use. but unfortunately no D8 thumbholes! A quick search on the net did not reveal anything else, which surprised me. If you would like to contact me in a PM with your address I can take a pattern off one of the saws I have. Let me know which era it is from the medallion or describe the content of the medallion as there are small variances. 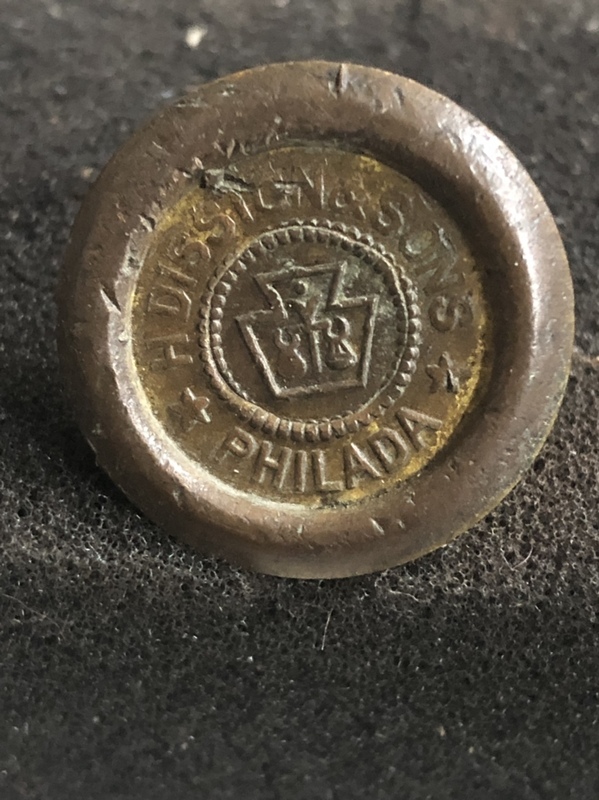 The medallion will most likely have either "Philada," "Phila" or USA on it as well as H. Disston & Sons. Ranger, you probably have as good a template as any already, in the picture you posted. Size it on your 'puter to get it to print out at a size that matches what's left of your handle & there it is. Unless most of it is missing, I prefer to use what's left of the busted handle. Saw it down the middle and you have your template, complete with the most important bit which is the precise bolt-hole positions. If it's missing horns and/or the narrow bit between the bottom of the grip & the the cheeks, they can be guessed pretty closely by referring to the picture. At least keep the cheeks of the original, they can be a big help in getting the blade in the right place & the bolt holes accurate. Don't rely on any hole positions that may be shown on a template of a generic handle, check them carefully against your plate before drilling, because there can be some variation. The trickiest part of making a precise copy of a D-8 handle (apart from getting hold of a sizable chunk of Apple wood!) is cutting the blade slot. The deep, circular part doesn't come through the top (the closed top was a boast of Disston, though frankly, I don't think it adds in any significant way to structural integrity!). You can cut about 3/4 of the slot with a straight-bladed saw, but you'll need some way of getting right in to that circular part. I ended up making myself a special-purpose saw just to finish the slot (shown here). Without something similar, I don't know how you could do it. I also am missing one of the nut / bolts. Do you know where i can get just one set? Also where would I source the apple wood? I can see why you want to replace the handle. 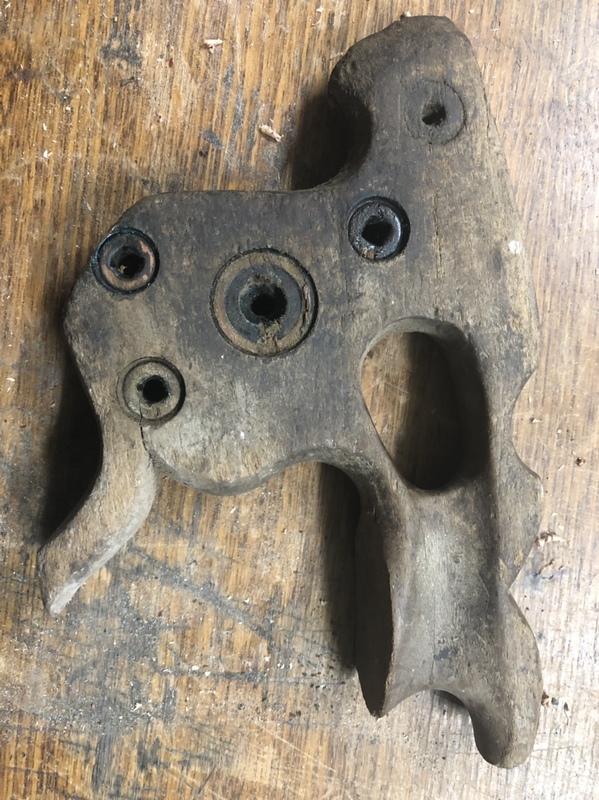 A saw screw pair is fairly easy as I could help there, but I have no idea where to source Apple wood. Even Disston went away from this timber after WW2. They used various hardwoods and sometimes coloured it to resemble something else. Some D8s from your saw's era, 1896 - 1918, used Walnut. In the US small quantities of Apple are sometimes available and possibly somebody else in Oz knows where to get some over here. Unless you need an absolutely faithful reproduction of the original saw, why not use an Australian hardwood? No issues with using another wood. My main concern was to replace the handle with the correct characteristics. Would Vic ash or tassie oak be suitable? I admirer you wanting to have a go at reproducing the D8 saw handle and hope all goes well. fruit wood with very similar grain characteristics to apple. and into the 1950's, you may come across a piece that would suit. I look forward to seeing the finished result, good luck. As the others have suggested, there are plenty of good local substitutes for Applewood. I second macq's suggestion of Myrtle, it's strong & a good wood to work with, and finishes very nicely (though not easily, it takes a lot of careful sanding to eliminate all scratches). If you get the right bit it can look very like Apple, so if you want it to look close to the original, that's the one I'd recommend. 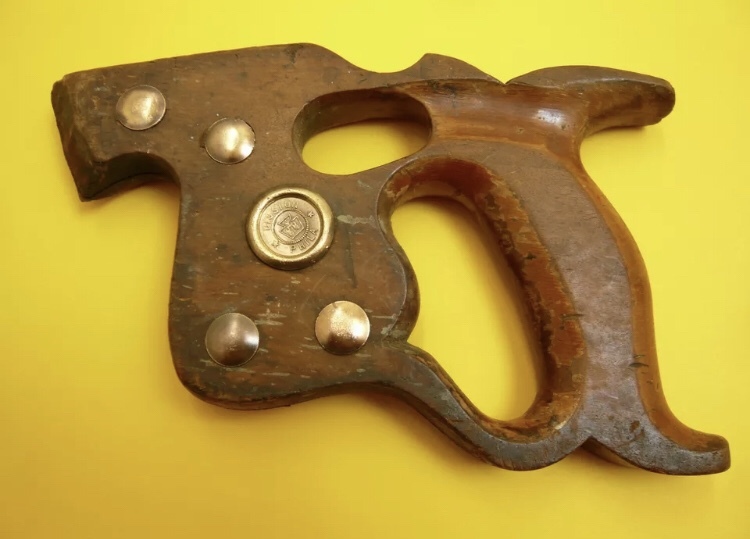 There is quite a bit of stuff on handle-making on the web - this bloke has done a thumb-hole from almost exactly the same starting-point as you're at. He's obviously a fairly competent carver & has applied his skills with gouges & whittling knives to the roughing-out part, whereas I use rasps to do the bulk of the shaping (with a little bit of judicious chisel & knife work here & there, depending on the actual handle). After cutting out & cleaning up the basic shape I cut the blade slot & drill the bolt holes. This can be tricky, as mentioned previously, so it's best done before you invest any more time, just in case it goes pear-shaped. Before starting on the shaping of grip & horns, I 'finger-gauge' a heavy pencil line around the centre, & another halfway between the centre & edge. These are invaluable in helping to keep the shape symmetrical. Roughing out with good rasps takes an hour or so, refining & cleaning up takes the rest of the day! Almost any hardwood will do, but most people take the opportunity to choose timber either to replicate the original such as Graham has suggested above with Pear or they select completely different attractively grained timber. In selecting grain look for a "tight" figure as the handle is small and large patterns become lost. There has been quite a lot of discussion on suitable timbers and some searching of this section of the Forum will help. In general the handmade saws section may give some insight. This thread contains a selection of timbers I used for a recent sawmaking project. If you can get any of the Casuarinas (She Oak, Bull Oak, Hairy Oak etc.) with their tight and dramatic figure they make spectacular handles. The difficulty is acquiring large enough sections that are defect free. IanW has made several using such timbers and he may be able to provide a link. For a handsaw you will need a board at least 150mm wide and closer to 175mm wide to achieve correct grain orientation. I think I’ll start with cutting a template from mdf just so I can get the feel of what needs to be done. I’ll follow up with the links provided and report back at some point.